The US Food and Drug Administration (FDA) is investigating claims the new quit smoking drug Chantix, released under the name Champix in Australia, is the cause of suicidal thoughts and related erratic behaviour in some patients. At least 100 cases of smokers experiencing psychiatric symptoms whilst taking the drug are being investigated in the United States. Patients claim that within days to weeks of starting the twelve week course of treatment, they experienced depressed mood, suicidal thoughts and behavioural changes for the first time in their lives. A spokesperson for the FDA did say, “Smoking cessation, with or without treatment, is associated with nicotine withdrawal symptoms and has also been associated with the exacerbation of underlying psychiatric illness.” But it is important to note, some of the cases being investigated by the FDA involve smokers who had no prior history of any psychiatric illness before taking Chantix. However, the makers of Chantix (Champix) were aware there might be a problem with the drug since at least November 2007 and yet, the drug was still released in Australia without warning consumers of these particularly troubling side effects, on 1 January, 2008. The European drugs regulator, the European Medicines Agency called for warnings to be placed on Champix back in December 2007. The agency was concerned about the numbers of reported suicide attempts by smokers who were taking the drug. Despite this, nowhere in the list of side effects released by Pfizer Australia is there any mention of suicidal thoughts or erratic behaviour changes. I did predict back in mid-December that Champix would go the way of it’s predecessor Zyban, which came under harsh scrutiny in the press several years ago when smokers reported similar psychiatric symptoms after taking the drug. As I revealed in my post of 17 December 2007, I stopped taking Zyban after the drug kept me awake for three days. Pfizer Australia did include sleeping problems on their list of possible side effects of taking Champix. So for me, the similarities between Zyban and Champix were just too big to ignore and I chose never to try the new drug. I would urge any smoker thinking about taking Champix should delay the decision until at least the results of the FDA investigation in the US are released. There are much safer alternatives available to the individual who wishes to quit smoking. A sometime contributor to my Chantix Blog on http://www.truthwillout.co.uk has just reported that a close friend of her partner’s family has just hanged himself whilst taking Champix. Normally mild-mannered, he began experiencing severe personality changes just 5 days into taking the drug, including paranoia and bouts of anger and depression. What is perhaps most shocking is that he reported these symptoms, including suicidal thoughts, and the medical advice was that these would disappear and he should keep taking the 2mg doses. Four and a half weeks into the course he killed himself without leaving a note. After all I have learned about Champix – and Pfizer’s callous, routine denials that the drug is to blame – I cannot say I am surprised at this tragedy, but Jane’s posts were usually chatty and lively, and this has just brought it home with a shock. This is not just some intellectual debate about the merits of various smoking cessation methods. This evil stuff is killing people in a random, unpredictable way which did not show up properly in the trials because the tests were inadequate, and every smoker in the world needs to be warned about these dangers AND advised that there are safer alternatives. This latest death is only one of many, and for every suicide there are many others that attempt it, or come perilously close. Still others are reporting wrecked relationships and erratic, reckless behaviour. If you want to read Jane’s original post – and links to many other personal accounts on other blogs – go to http://www.truthwillout.co.uk and click on Champix/Chantix on the right side-bar in the Blog section. Jane’s latest post is number 90. I intend to make sure many thousands of smokers all over the world get to hear about it, and I hope Pfizer end up drowning in lawsuits over this horrible drug, which doesn’t work in most cases anyway. That won’t bring any of these people back, but it may lead to real, lasting change in the way drugs are rushed through the approval systems without proper testing for safety. I left a comment on here on the 21-12-08 that was incomplete as I submitted it accidently before I’d finished. I only took the drug champix for 9 days but that was enough to almost send me over the edge mentally, feelings of anger, hatred, rage, depression, anxiety and panic attacks were pretty overwhelming and totally out f character for me and luckily I stopped when I did otherwise I don’t know what might have happened. I can say that when I stopped taking the champix, I did get withdrawls from the drug for about 3 days after and I could not work, mainly feeling extremely anxious, panicky and edgy after I stopped taking it. I wouldn’t reccommend champix to anyone except my worst enemies! I have now stopped smoking for 12 days (01-01-09) by using nicotene patches and I’m feeling just fine, it’s a hard habit to break but not impossible. Both myself and my husband have been taking Champix for the last four weeks. I researched it before I took it and only took half the dose from the beginning and for the last two weeks I have been taking half a tablet once a day. I have no desire to smoke and have had minimal side effects, heartburn which has settled down and pain in calf muscles which comes and goes. My husband has had no side effects but did get a pain behind his knee for the last few days which he is having checked out today. We are both delighted to be free and to be honest when I quit cold turkey I was so depressed, angry, hungry and got numerous chest and sinus infections. I think when taking this drug you have to be very wary of the side effects and if you get depressive thoughts stop taking it immediately. Some people have had a very hard time but maybe the dosage is too much for them. My husband has noticed no difference from taking 1mg and 2mg. I would much prefer to suffer some discomfort than to get a horrible disease from smoking and I have tried every other option available. I think people should be made very aware of the side effects and to seek help straight away if bad side effects occur. It does stop me smoking and I plan to cut down even further and only take half a tablet every second day. Best of luck to all users. I thought Champix was great. After a week I didn’t even want to look at another cigarette. I did experience the nausea and vivid dreams. I thought the side effects were worth it just to be free from cigarettes. Week 2 I started having strange thoughts, and having really strange dreams. I started acting differently, I started getting irritable and irrational with my friends. It was like something was taking over, I would have moments of clarity where I would realize how crazy I was starting to act. And then at work I decided the smart thing to do would be to take all of the pills in my home. At that moment a strange sense of peice fell over me and everything had a golden aura. That night I got home and wrote my father a goodbye email as well as a close friend. Luckily my roommate came home early and discovered me all disoriented after taking a bottle of everything I owned. I ended up spending 2 weeks on the psychiatric ward. I had no previous depression issues, and I’m also a nurse so I never thought anything would go wrong. I had read the pamplet though before I started the pills and they did not warn of these serious side effects. I can’t imagine what my family went through, they didn’t even have my address yet because I had just moved. Anyway, its been over a year now sinse the incident and I’m still irritable and angry person which is nothing like my prechampix personality. I’m also contantly in pain in my joints..I’m not sure if this has anything to do with it, but its really strange. I felt I needed to share my story to warn everyone what can happen. Be very careful and have your friends, family, and doctor monitor you while on this drug. It can be very dangerous. Why risk it at all? In the only known head-to-head trial between Champix and nicotine replacement therapy, there was no significant difference in the results at either 6 months or one year. By the way, I don’t mean to suggest that NRT is “just as good”. The fact is that they are equally bad in the long run, with Champix having a few horrifying extra drawbacks. If you read the so-called “positive” reports for Champix, you will find that the majority of those people are either still taking the drug or have only just started taking it, and they are so excited to be not smoking at that time that they start recommending it to everybody. This is why Jennifer’s post is so important when it comes to looking at the bigger picture: “I thought Champix was great” she begins. When you look at results at one year – which is, after all, a sober way of looking at it – neither NRT, Zyban or Champix has ever scored higher than 12%. Acupuncture seems to average out at about 25% for smoking cessation, long term. No risk. For results above 50% success at one year, only two methods have been shown in scientific trials to have achieved that: the Allen Carr method, and hypnotherapy. No risk. I have been on Champix 2xs and both times it has led to depression,nausea,bad dreams,feeling spaced out and not in touch with reality.When I stopped Champix of my own accord I really wanted to smoke still as the urge was always there.I had a problem with a phobia I had and had acupuncture~for some reason the desire to smoke has vanished since this was done.I would not recommend Champix as its bad stuff-very unpredictable. I even know someone who committed suicide on this drug- a relation of my O/H who had no history of depression .Finding your husband hanging in the garage cos of this drug is not very nice. Know a really good bloke called Chris Holmes who has written a great book Nicotene the drug that never was’.He is running a campaign in the UK about this drug-Champix.Google truth is out Champix. Actually the Truth Will Out Campaign was originally about nicotine replacement products, but the Champix catastrophe just exploded at the same time, and I am genuinely horrified by the stories of suffering and tragedy that have been posted on http://www.truthwillout.co.uk over the last year. I’m now committed to getting it withdrawn as soon as possible. That is part of a review posted on Amazon.co.uk recently by a chap from Brisbane, and the book he is talking about is Nicotine: The Drug That Never Was. If you are interested in these matters why not go to Amazon.co.uk and read the rest of the reviews there. This is the first book ever to prove that the nicotine tale is a lie, and demonstrate that the urge to pick up a cigarette has nothing to do with the contents of the smoke at all. I also explain in the book exactly how we shut smoking habits down with hypnotherapy. Nicotine Replacement Poisoning is based on a myth, and should never have been passed as a medication in the first place. There is no such thing as “therapeutic nicotine” – and I will prove it to the world. Wow, I’ve wondered in the past 4 weeks, what had happend to the wonderful, caring life partner for the last 4 years. He went on extended holiday, started the champix during this time. We spoke daily and when when met up 7 weeks later, he was a different person, Meanwhile I’d started on the Champix too. What a nasty combination. Mood swings, irrational behaviour, everything as above. Suddenly I’m single, dead scared about his mental state, but unable to get through to him, that it’s the champix. Me scared. I want my husband back too! he started taking champix just beofre christmas 08 and got off it 2 -4 weeks in because he was suffering scary dreams, migrains, and irritability, but then he started getting snappy with me and withdrawn, doesnt show love and affection, no cuddles, not text messages everyday like he has concistantly in our 5 year marriage! the person I married is not that person anymore! I am hurting and living a hell, as he doesnt want to be with me anymore. Ive been trying to figure out whats up and why he has changed so dramatically and why he’s become so hostile and irratic. It never accured to me that these side effects could last this long, but yesterday I remembered the CHAMPIX and im horrified to know that and im convinced that this is his problem. which is also mine now! Can I reassure you that in all the cases I have been told about so far, the person gradually returns to their usual self, but how long that takes varies quite a bit. Some people feel very shaken and affected by the experience, but apart from the suicides I have not (so far) heard of a case where the personality changes did lasting or permanent damage. Also, I have not yet heard of any cases where a suicide bid was made after stopping the medication, so hopefully he is not at severe risk of that any more. Could you please keep us posted about your husband’s progress, as others may need reassurance too? I sincerely hope you get your man back okay. Also please, please make sure the prescribing doctor reports this horrible reaction to the medical body that is supposed to protect the public from dangerous medications. In fact, that should go for anyone who has had a bad reaction – tell the doc! Protect others, make sure it gets reported. chris, thanks for your response, at this stage it is good to hear that he will gradually return to himself, i hope that day comes soon because its almost hitting 3 months of this torment. Since Ive come to the conclusion that it is champix that has made him this way, i feel less emotional and more understanding of the situation im in. If it wasnt for me investigating my husbands case, he would be still believing that he’s changed over night and that we’ve drifted apart and would be heading down the road to divorce and loosing everything that he’s worked hard for- he was even on the brink of quiting his job a few weeks ago!!. I printed out the many stories that i found over the web and got him to read them, and left him to take it in this week. he told me tonight that he is going to move out temporarily to clear his mind, and we had a good positive talk about what he is going through. I told him that im worried for him an that i feel that he is experiencing depression, and that he should go see the GP that prescribed him the champix and take it from there- he’s agreed to that. He admitted to me that he could relate to the stories that he read. I asked him what physical things he was feeling besides, migrains, back pains, and depression. i asked him if he had any numbness in his feet or such and he told me that he has numbness in one of his hands. i asked him if he’s experienced a yuckky metalic taiste in his mouth and he was surprised and said yeah thats why ive been goinng to the denist in the last 2 weeks. hes been replacing his metallic fillings because he thought that was where the metallic taiste was coming from. hes never had a great memory but that seems to be even worse now- and ive told him to start keeping a journal so he can refer back to things if he needs to. He’s still having the horror dreams at least once a week. Im hopefull that things will sort themselves out- i just hope it happens soon, and await the day that I see a smile back on my babys face! 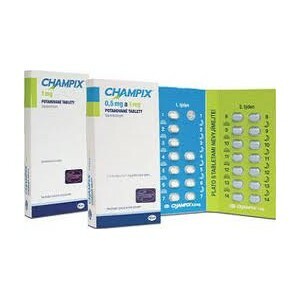 this CHAMPIX is not worth taking, not unless you want to experience some major drama in your life! is there an active support group for victims of this drug? If not maybe it would be a good idea to start one! I want to join in a class action lawsuit against this company. Any information or help on this matter would be appreciated. Girlfreind is in 2nd week. She mentioned dreams the first few days.Then We had a fight and just like that we are done. She had hate filled eyes when I last saw her. Good stuff for quiting cigarettes and lovers. I tried this poison in 2008. Had a complete psychotic breakdown, wanted to paint the bathroom red, spent a week in hospital, brain chemicals got very messed up. No previous history of depression, anxiety, psychosis etc. I never got my life back after that! Early 2009 was diagnosed with chronic major depression and panic/anxiety attacks with thoughts of suicide, all of which I’m told I will now have for the rest of my life. Wish there was a way to sue Pfizer for this new life I struggle to live with. My daughter was prescribed Champix to help her stop smoking a few years back. Within 10 days of taking champix she was admitted to a Psychiatric ward. She has never had any type of psychological allnesses before this. She was released after 2 weeks. Back to normal . But since then she has had recurring episodes of severe depression. The doctor diagnosed her with Bi-polar. But I know its not that. It all started with that damn Champix. Is there any class actions happening in Australia against Pfizer?